Push. – Life Is Such A Sweet Insanity. We live alongside one of the stations along the CTA Brown Line. For those not familiar with the ‘L’ in Chicago, the ‘L’ is our version of the subway. Most of it runs on elevated tracks throughout the city, with only some portions in the downtown area underground like a traditional subway. It’s one of the best run mass transit systems in the country. The lines are marked by color; it is a prime example of the KISS (Keep It Simple, Stupid) concept. I love the ‘L’. The closest crosswalk to our building is near the ‘L’. It is controlled by a traffic light installed specifically for the crosswalk. We lived here for less than a day when I discovered two things about this traffic light: 1. 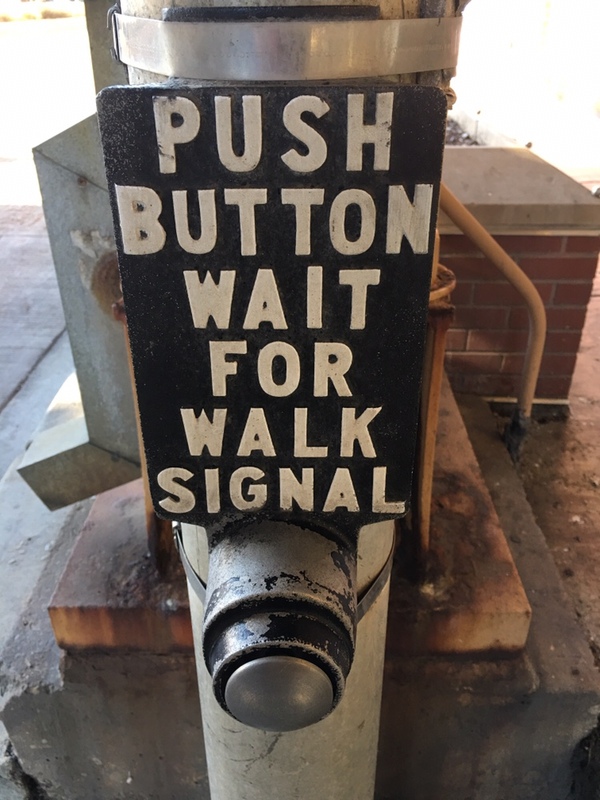 The light will not change unless you press the button at each end of the crosswalk and 2. The light will change in tandem with the traffic light at the nearest intersection. It will not change separately. One thing that amazes me about this crosswalk is the number of people that can’t be bothered to press the button to get the light to change. The buttons are marked with large signs. The roadway is busy enough that at many times of the day it can be a challenge to use the crosswalk against the light. There’s a reason the traffic signal is there. But several times a week I’ll see people trying to run across traffic, narrowly missing getting hit by cars whizzing by. Often folks will just stand there and stand there waiting for the light to change, when I can see the light at the nearby intersection going through its cycle. Had the pedestrian pressed the button as instructed, they would have been able to cross the street with ease. Occasionally drivers will stop at the red light that allows pedestrians to cross and once it’s clear they’ll run the red light. Sometimes the crosswalk isn’t clear and people start driving through anyway. Like many other parts of the country, motorists in Chicago can be quite inattentive, especially the ones that are busy on their phones while they’re driving. I think it drives Earl crazy that it can be 2:00 a.m. and I’ll press the button and wait for the signal to cross instead of crossing the empty street against the light. He always claims that I must have been Boy Scout in a previous life, but I assure him that was not the case. I just try to follow the rules, especially the ones that follow logic.